The express evaluation consists of installing the Vault Client and connecting to our public demo server. With minimal steps, you can start evaluating Vault right away. Verify that your machine meets the Client requirements. Connect to the public demo server. Enter a Username (guest1, guest2, guest3…guest10). The Password is the same as the Username. 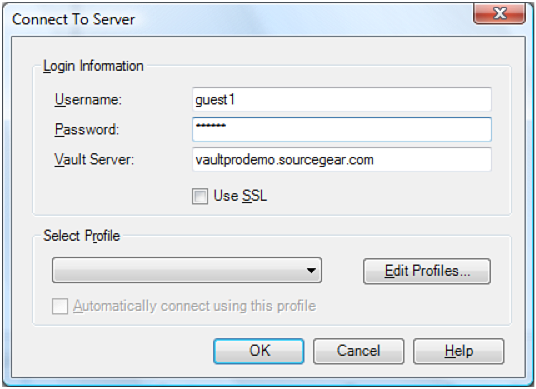 The Vault Server hostname is “vaultprodemo.sourcegear.com”. Once you are connected to the public server, you will be prompted to choose a Vault repository and then you may begin your evaluation. SourceGear’s technical support manager walks you through getting started with Vault Professional in this brief video. Please feel free to add files and create folders in the demo repository. Obviously, you should not add anything which is important or confidential. The contents of this repository will not be preserved when we upgrade the demo server, and may be deleted at anytime. Within Visual Studio select Tools → Options, expand Source Control and select Plug-in Selection. A dropdown menu will exist under "Current source control Plug-in" providing you with the option to chose between the Vault Extension for Visual Studio, the Visual Studio Enhanced Client or the Classic Client. Want to integrate Vault with Eclipse? Please let us know. We’re always happy to help.